Everyone knows our floors are a mess. What you may not know is how badly this sometimes depresses me. Mostly because, no matter what we do to to the interior decor, the floors stare back at me in all their paint-spattered, buckled, worn out glory. There is no escaping them. The other day, I decided I’d sand down the tiny little entryway area so that I could see just how nicely the floors *could* clean up, when we get to that project. I figured it’d make me feel better, and it did. For a few hours of sanding, staining and varnishing, I got piece of mind and a very pretty entryway floor. Great job Mindy! I know how discouraging it can all be when a project as big as refinishing flooring is still looming over you. Your small entry way was a great way to get a new floor “fix” without doing a whole giant room. Very nicely done! Hi Mindy! I’m all over this! I recently posted about having “one place”…just one…that I could go to that was “finished”. It reminds me of how the rest of the house will eventually look some day and it de-stresses me completely! Love the floor!!! Press on, my friend…press on! That looks so nice! 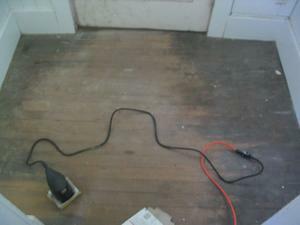 You did a great job…just imagine when all of your flooring looks like that! Our floors now in the living room are *gulp* painted plywood. I had to rip up the carpet due to allergy problems and we were planning on keeping the carpet (hubby wanted to keep carpet, I didn’t). Our new wood floors won’t go down until we finish our other projects in the kitchen and living room, which won’t be till early next year. My floors depress me too – I so understand! That floor looks great! Sometimes you just need a little taste of instant gratification to keep going on the long-term projects. I’ve been keeping up with the progress.. great work. Could you do some photos with a walkaround of the house so we can see what the addition looks like? I have been meaning, for many months, to put together a little walk-through tour complete with floor plans. I have the best of intentions, but very little follow through thus far.